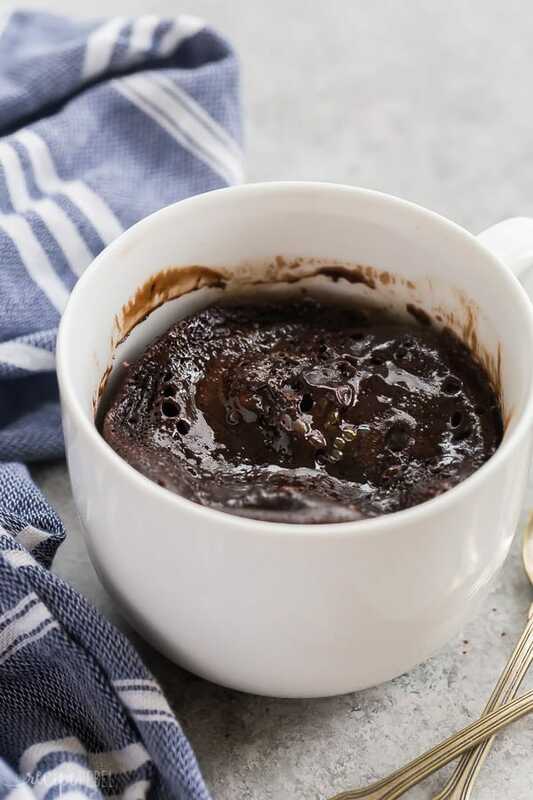 This Mocha Chocolate Mug Cake is incredibly easy and incredibly decadent — it has a gooey chocolate center and a touch of coffee to make this the perfect afternoon pick me up! So I have this habit of hitting the chocolate or the ice cream after the kids get to bed for the night. I’ve earned it, haven’t I?? We are smack dab in the middle of my husband’s busy season so I am single-momming it from 7 in the morning until late in the evening, at least 5 days a week. Which means that the only things that keep me going are chocolate and coffee (namely, this Mocha Chocolate Mug Cake). Throw a scoop of ice cream on top and it is like sanity in a mug! I first came up with this chocolate mug cake a while back, and I’ve been hoarding it selfishly to myself. I’ve had so many mug cakes that were dry or, just too cakey, you know? Cake for me is actually not all about the cake, unless the cake is That Good. And rarely is a mug cake That Good. It’s about frosting or ice cream or caramel sauce or something else that makes the cake worth the calories. But this Mocha Chocolate Mug Cake? It is That Good. I wanted it to be more like a pudding cake (because you know I love me a pudding cake! ), with a chocolate lava center, and it was even better than I ever imagined. If you love pudding cakes as much as I do, you might also like this Pumpkin Pudding Cake, Red Velvet Pudding Cake, or my Grandma’s Hot Fudge Sundae Cake. Choose the right mug. You want a mug that is large enough to hold all that goodness without splattering, because what you do not want to be doing after the kids are in bed is cleaning the microwave. Trust me on this one. Choose the right chocolate. Dark, semisweet, milk chocolate — they will all work just fine. Choose one you enjoy, because it will taste like what you put in! Stir it well. The chocolate is still going to be slightly warm when you add the egg, so you want to act quickly and whisk it in before you end up with scrambled eggs. Extra smart people would wait until the chocolate is completely cool. Impatient moms just whisk it like mad. You choose. 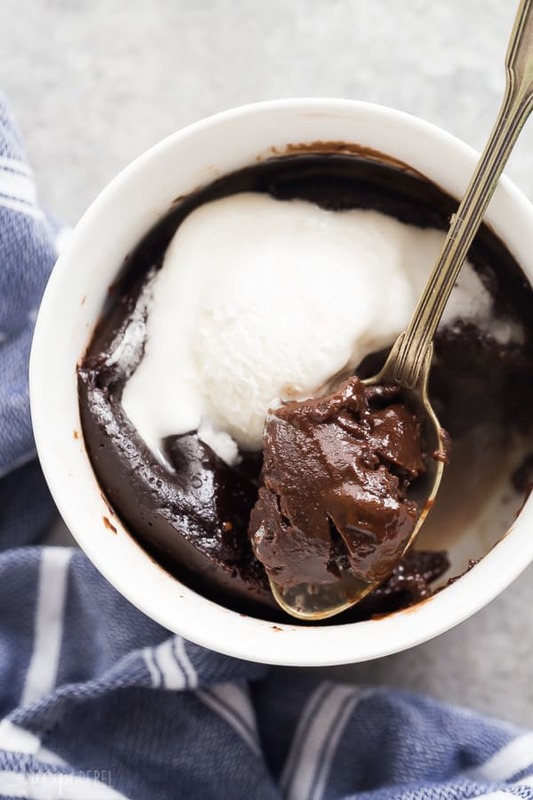 This Mocha Chocolate Mug Cake is incredibly easy and incredibly decadent -- it has a gooey chocolate center and is made with real ingredients. In a large (16oz) mug, stir together chocolate chips and oil. Microwave on high in 15 second intervals just until melted, stirring each time. Let cool 2-3 minutes. Stir in sugar, flour, cocoa powder, coffee and egg until combined. Microwave on high for 75-90 seconds, until cake on top is set but gooey in the bottom. This was an easy and delicious treat! Thanks for the recipe. I can see myself whipping a couple of these up for those moments when I need to have some one-on-one bonding time with my kids. Thanks Andrea! I’m so happy you liked it! 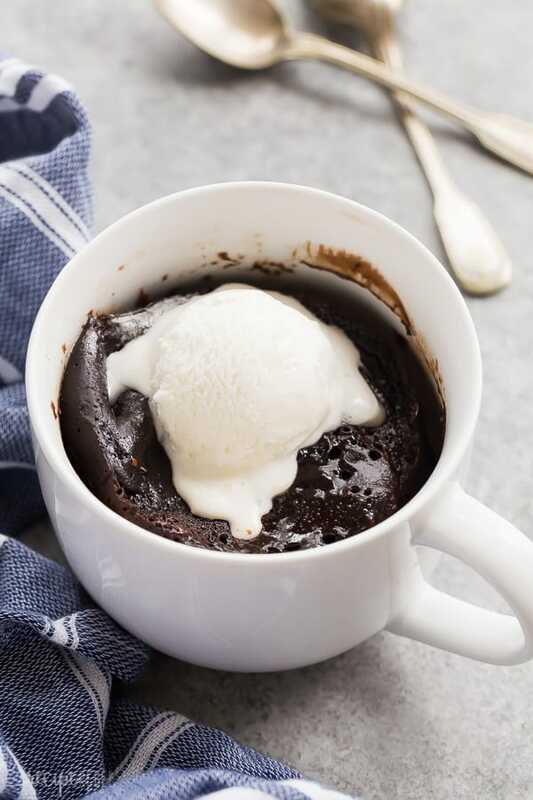 LOVE LOVE LOVE this easy mug cake recipe! Oh girl, that mug cake is delicious! I love chocolate and coffee together. Mug cakes are the best!! Sometimes I don’t want to make huge desserts and these single serving ones are a life saver, especially with my sweet tooth!! I love a good mug cake and this looks amazing! If you’re not a coffee drinker can you sub for milk or water?